For some reason, the only time I think about making Razz-Ma-Tazz bars is when I have white chips that need to get used up. This is sad, because Razz-Ma-Tazz bars are delicious and deserve a higher status than that of “way to use stuff up”. They are extremely easy, look pretty and taste great. No wonder they won a contest. The recipe was put out my Nestle, but you can use whatever brand white chips you like. Today I used Ghirardelli. I like almond extract, but for those of you who don’t, vanilla would be a fine substitution. And of course, you can change out the jam. I always say I’m going to do that one day, then never do. This recipe can also be halved and baked in a 9×5 inch loaf pan. Since I have lots of goodies around this weekend, I kept the batch small. Here’s what it looked like right out the pan. ……. And here are the bars after they were cut. Much better. Here’s a link to the recipe. For convenience, I retyped the recipe below with a few very minor adjustments. Preheat oven to 325° F. Line a 9 inch pan with parchment or grease. Melt butter in a large microwave-safe bowl on high for 1 minute; stir. Add 1 cup morsels; let stand. Do not stir. Beat eggs in large mixer bowl until foamy (I used a wire whisk). Add sugar; beat until light lemon colored, about 5 minutes (again, I just whisked for a few minutes). Stir in morsel-butter mixture. Add flour, salt and almond extract; mix at low speed until combined. Spread 2/3 of batter into prepared pan. Bake for 15 to 17 minutes or until light golden brown around edges. Remove from oven to wire rack. If jam needs it (mine didn’t), warm it up a bit in a small, microwave-safe bowl for 30 seconds; stir. Spread jam over warm crust. Stir remaining morsels into remaining batter. Drop spoonfuls of batter over jam. Sprinkle with toasted almonds. Return to oven and bake for 25 to 30 minutes or until edges are browned. Cool completely in pan on wire rack. Cut into bars. Makes a 9 inch pan, so you can figure out how many bars you want. I cut mine really small. 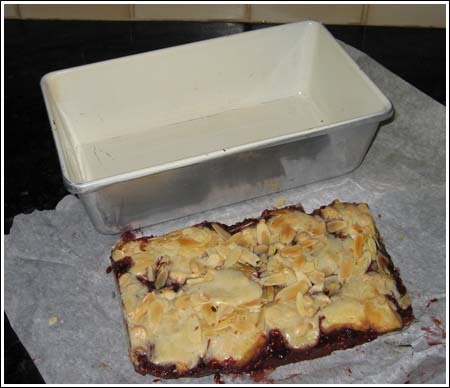 i love love your blog, just want to ask you a question, i am a beginner, and i want to try some recipes, like razz ma tazz bar and apple bar, can i freeze these bars? Sorry to hear your raspberry bars didn’t work out. Just so you know, the bottom is supposed to be firm, but not dry. It shouldn’t be greasy, but it shouldn’t be dry either. You might have accidentally added more butter. Probably not, but it happens. Or maybe you didn’t add quite enough flour? I wish I had the answer. Or maybe you’ll like them better after they sit. Katie mentioned she liked them better the second day. I made these today. For some reason, mine turned out really greasy on the bottom of the crust–am assuming that’s not how they’re supposed to turn out? Or does the grease dissipate after they sit for awhile? Thanks for any tips for making them in the future! I FINALLY got around to posting about these on my own blog today…I don’t have a square pan, and I needed a bigger batch than a loaf pan would allow when I made these, so I did the recipe x 1.5, and that worked perfectly for a 9×13. Thanks again for posting these (I thanked you on, my blog, too :))! Anna, thank you so much for posting these! (Mostly for listing them in your “top ten”, which is where I found them. I made them for a holiday celebration last weekend and I was THRILLED with how easy and delicious they were! Thank you! Thanks for the question. I’m sure someone else has wondered the same thing. When I say 9 inch pan, I’m referring to a 9 inch square metal pan. In the future, I will be more specific. Glad you enjoyed them even though they were thick. Wow. I am going to have to try the sour cherry/macadamia combo. Yum. Hi. I made these last week with blackberry jam and they were yummy. Then yesterday I decided to make these for Thanksgiving but I didn’t want to go back to the store. Using what I had on hand, I made them with sour cherry preserves and chopped up macadamia nuts and cashews. I put the nuts on top of the preserves instead of on top of final batter layer. These are otherworldly. I kind of want to keep them at home…but I won’t. I will share. Changing pan size probably made them cakier and thicker, but I’m glad you like them anyway. They’ll taste even better tomorrow. I hope your co-workers like white chocolate. Okay. The verdict is in. These are yummy. My hubby isn’t such a fan even though he is a white chocolate fiend. I, however, think they are great. It’s a cakier recipe than I expected. the texture is nice and even– but they are think. I think next time I might try this in a slightly bigger pan. I am living overseas and the pan sizes here are different from home. I can’t wait to share these at tomorrow’s staff meeting! Anna– should the chips for the bottom layer be completely melted by the butter? I am throwing this together now, but I was a bit worried.. hmm… we’ll see how it comes out! Wow! That’s good news. Thanks for the comment, Jilly. 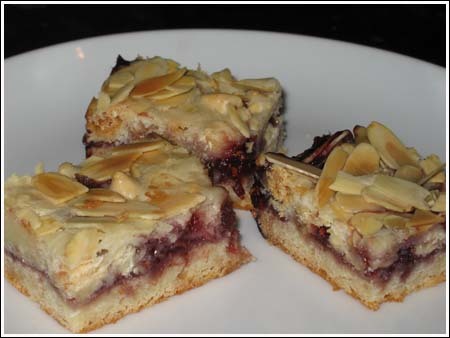 I just made a batch and they’re the best raspberry bar I’ve ever made. Ooooh, I love raspberries. I’ll have to try these out. Lynne, I’m sure your son is fine, but if he ever complains of ear fullness, tell him to tell the doctors to do a CT scan. That’s how they found (the rest) of mine. A lot of times they find them in routine childhood ear surgeries (tubes), but they need to be watched because they often grow back. When they grow back, a good choice (probably better for adults) is to have the whole ear canal wall taken down so that the doc can just scrape it out on a routine check. Oh yum, these look great and I’ll be trying them very soon! Oh, Anna! I’m so sorry about your ear! You are way too sweet to have such a serious ailment. My 19 year-old son had surgery for a cholesteatoma when he was about 5. The doctor was checking his ears and said, “uh-oh”. It looked like a tiny pearl on his ear drum. We were VERY fortunate that there was no permanent damage to the boney structure and no hearing loss. That wasn’t the case for the little boy who was his roommate. The cholesteatoma crushed all three bones so he lost his hearing in one ear completely. You will be in my prayers. BTW – LOVE the adorable picture of Fuzz and Mega-Kitty. I so enjoy your site. mmm, these look good and I think I have all the ingredients at home. May have to make them for my coworkers. Claire, I hope you try them. They’re really good. Penguin, I looked at the Nestle picture, and you are right. The appear to be somewhat Photoshop enhanced. The bars in the picture on the Hershey’s website have jam with a freakishly day-glo pink hue. Your finished product looks much more appetizing, even uncut! 🙂 BTW, love the new site! I have been wanting to make these FOREVER! I think I’ll have to, now.